and so is your bank. Download our app to access your account on the go! Check your balance, transfer money, or pay bills any time, any place. Search fnbtrinity in the App Store. First National Bank of Trinity has a wide array of services to meet your every banking need. 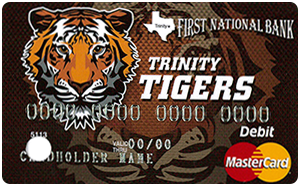 First National Bank of Trinity is an independent, locally owned community bank. We are managed and staffed by people that you know and trust. We are dedicated to the overall strength of the Trinity community. Come talk with us. We have been here for years and will continue to offer hometown banking for years to come. Beginning January 1, 2013, funds deposited in a noninterest-bearing transaction account (including an Interest on Lawyer Trust Account) no longer will receive unlimited deposit insurance coverage by the Federal Deposit Insurance Corporation (FDIC). Beginning January 1, 2013, all of a depositor's accounts at an insured depository institution, including all noninterest-bearing transaction accounts, will be insured by the FDIC up to the standard maximum deposit insurance amount ($250,000), for each deposit insurance ownership category.